The Eagles held a bling party Thursday night when they received their Super Bowl rings. A few of the Eagles, like Malcolm Jenkins and Chris Long, have won before, so they were a little used to the mountainous diamond-encrusted pieces of jewelry weighing down their hand — and what it signified. There was one member of the Eagles’ organization, however, who played a major part in their success last season that the precious bauble may have held a little more meaning for — Eagles’ defensive line coach Chris Wilson. Wilson, who can easily be defined as a football lifer, never won at any level prior to 2017, going back to his days as a high school star at Richardson High (TX), to playing for the Oklahoma Sooners from 1988-91, and including 25 years of coaching — until now with the Eagles. “I’ve never won, not like this, and I’ve been involved with football my whole life,” said Wilson, who’s transformed the Eagles’ defensive front into one of the NFL’s best. “I’ve won conference championships, Big 12 championships at Oklahoma, so maybe when I get the ring Thursday, that kind of puts it to bed. Getting a ring certainly dredged up Wilson’s journey, beginning at rock bottom where most coaches start, as a graduate assistant, responsible for all of the countless hours and mundane chores. Wilson may have reflected back on the times in the dark room stacking pads and cutting up film, gathering equipment, securing scouting reports, making travel arrangements, being a liaison between the coaching staff and players, fetching coffee. Wilson has been everywhere, too, from Indiana State, to Northern Illinois, to Northeastern State, to Illinois State, to Colorado, Oklahoma, Mississippi State, Georgia, USC and he’ll be entering his third year with the Eagles. In the time he’s been part of Doug Pederson’s staff, Wilson played a big role in Brandon Graham’s upward trajectory, which resulted in him having his best season as a pro last year, leading the Eagles with a career-high 9.5 sacks, including his career-defining strip-sack in Super Bowl LII. Under Wilson, the Eagles, for the first time since 2002, had four defensive linemen record five-plus sacks in a single season: Graham (9.5), Pro Bowl tackle Fletcher Cox (5.5), end Chris Long (5.0) and rookie end Derek Barnett (5.0). Back before his first season with the Eagles, Wilson had to overhaul a mess, with players out of position, namely Graham. The Eagles transitioned back to a 4-3 alignment, moving Graham back to his natural position as a defensive end, after playing three years at outside linebacker. “The first thing that got me into coaching was football has been such a big part of what had done for so long,” Wilson said. “And two, coaching gave me a chance to help a lot of guys like me; a lot of guys that this is their outlet; guys that needed a solid foundation and that was a big part of it. Topping it off was winning. The Eagles’ defense gave up record numbers in Super Bowl LII. For one, the Eagles and Patriots combined for the most total yards in any game in NFL history, regular season or playoffs (1,151), along with the most combined passing yards in a postseason game in NFL history (874)—and the Eagles gave up a record 505 yards passing to Tom Brady, the most passing yards in a postseason game in NFL history. 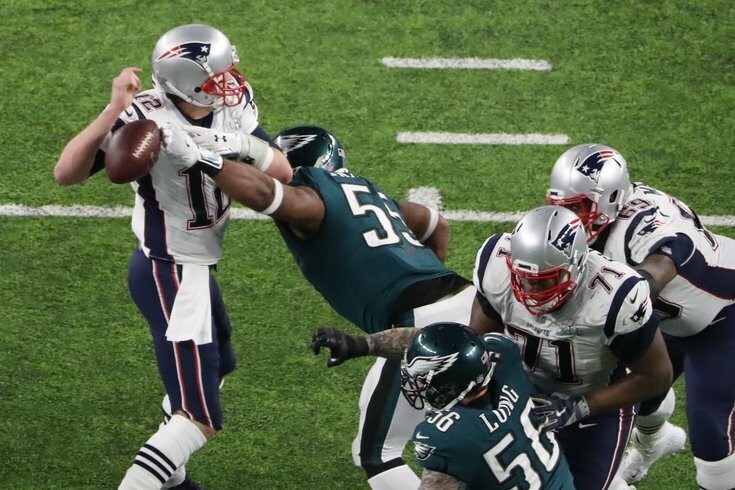 What will forever resonate is the biggest play of the game, when Graham sacked Brady in the fourth quarter and Barnett was there to pick up the loose ball. It was the Eagles’ defensive line that came up with the most crucial play in the most crucial moment. It was Wilson’s guys who did it. Take away the “Philly Special,” and Zack Ertz’ diving touchdown that eventually spelled the winning difference, if Brady wasn’t sacked and stripped of the ball, there may not have been a mega-parade down Broad Street and ring celebration Thursday night. Wilson may never have received his yelling-from-the-mountain-top moment with the mountainous trinket — a Super Bowl ring. “I’ve been a part of teams that have played for national championships, but never won it,” said Wilson, who has his bachelor’s degree from Oklahoma in communications. “This is the first time I’ve ever been on a team that’s ever won everything, to win it all, this is the first time. “I woke up the next morning after the Super Bowl and I still didn’t process it. Then it’s like, check the box. It won’t really hit me until the ring ceremony Thursday night. You look down at the ring, there is it. You put all of those times you sacrificed to make it happen.